'Deanta' offers the largest lippings available in the UK internal door market. All of their doors have 18mm lippings around the entire door meaning that hinging can be fitted without hitting the solid wood core. A total of 32mm can be taken off the height and width of all standard non FD30 'Deanta' doors ensuring they will fit into any size opening. 'Deanta' produce solid doors with specially selected crown cut oak and walnut veneers to give a real timber look and feel. 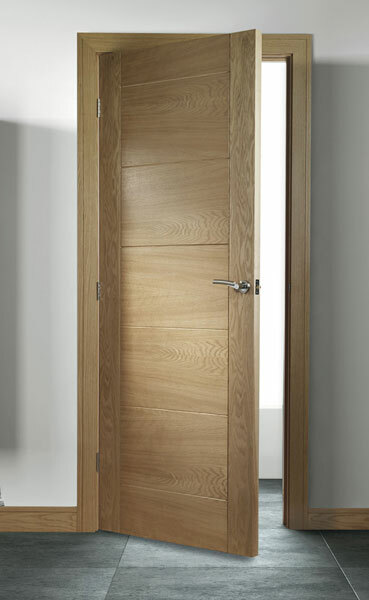 All of Deanta doors have an open grain finish resulting in a more natural looking product and are heavy and robust by using recycled FSC certified solid core. 'Deanta' Obscure toughened glass is manufactured in a way as to make it very easy to clean and it won’t mark or stain. Featuring North American white oak veneers, the Sevillia prefinished interior door adds a natural, modern style to any room. Its clean, bold lines give this flush door an unmistakable look that will transform the look of any modern styled home.